Spot 2016 is an improvement. I am not a headlamp gear freak, but it was time for an upgrade. The 2016 version performed very well while cooking dinner in the dark and other activities such as cleanup, hanging food sacks in bear country, reading, and not blinding my partner in the tent on a recent 5-night trip. I used the headlamp every night. Spending time at home mastering and memorizing the features and their control is a no-brainer. Do it. The new maximum output of 200 lumens at 80 m is a nice, but usually unnecessary, feature. Still, I used it. When you desire big output, it's there. The new model is more water resistant than older ones. I've never owned a waterproof headlamp, so I always protected them under the bill of a rain hat or rain jacket hood (never had a problem). I tested this model under a steady drizzle one night and didn't encounter any problem. Switching between spot, broad, and red illumination isn't difficult; just learn the sequences. The transition from brightest to dimmest output and back to brightest is relatively seamless and easy to master. Battery life: reviews on websites range from castigation to holy praise. I use lithium batteries in headlamps. Unlike alkaline dry cells there are few, yet subtle, warnings in the stage near "death." Many people underestimate the cumulative time the headlamp: uses a set of batteries, spends at various degrees of lamp output, and is on at various temperatures. Other factors include the type of battery, whether they are stored in the unit or kept separate until needed, and actual age of the battery. I keep headlamp batteries warm in a pocket in cold weather until needed and out of the unit in warm temperatures. A manufacturer's claims for battery life are based on controlled conditions. We collect empirical data. In conclusion, I'm pleased with the battery life for the 2016 Spot. Bottom line: Is this a search-and-rescue light? No. Is it an appropriate household/backyard headlamp? No, it's an overkill. Used judiciously, it more than suits my needs as an avid 4-season backpacker. 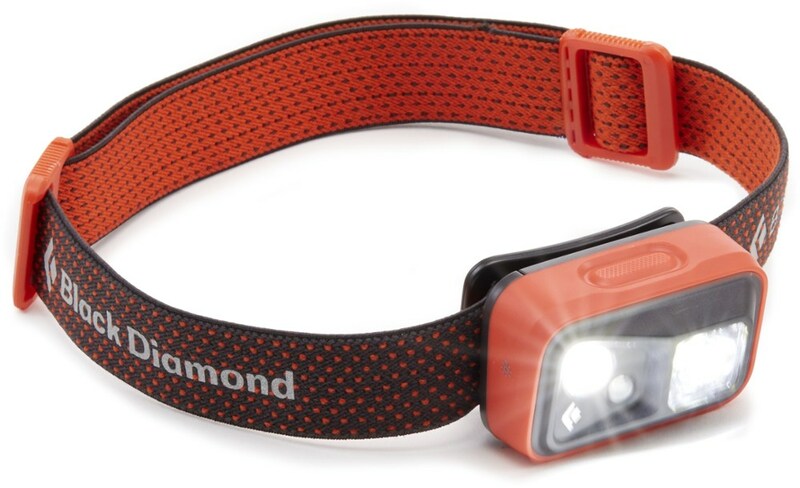 The Black Diamond Spot is a very durable headlamp that provides more than adequate light and is a great headlamp for just about any outdoor activity. While it has a few less desirable features, this headlamp has served me well since I purchased it back in the 2014 timeframe. I purchased the Black Diamond Spot headlamp back in the 2014 timeframe and this has been my go-to headlamp since that time and I don't ever anticipate replacing it unless it breaks as it meets all my needs and provides great light. I have owned a lot of headlamps over the years from a Justrite headlamp that I picked up back in the '70s that had a nice bright light, but weighed a ton due to the four D cell batteries, to a number of incandescent based headlamps that used AA batteries and then a few LED based headlamps, including the Black Diamond Spot. With the most recent batch of LED based headlamp designs, I think we have hit a real sweet spot in that you have very bright light, excellent battery life, and small lightweight designs. 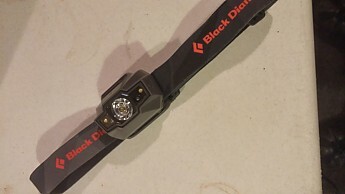 My version of the Black Diamond Spot is rated at 130 lumens, which I have found more than adequate to meet all my needs when I need to use a headlamp. While I always carry a headlamp when I am backpacking or hiking, the majority of the time when I actually use a headlamp is when I am supporting search and rescue activities in our local area, which always tend to be at night. 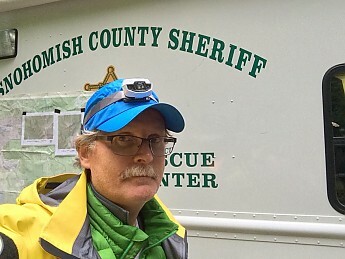 Search and rescue is a really good environment to prove out a headlamp design as you tend to be using for long periods of time, on the order of 6 to 8 hours, and most of the time there is inclement weather (at least up here in the Pacific NW...), so you get a good appreciation of the basic design and battery life. While there are a few design features that I think are lacking with the Black Diamond Spot, from a performance and durability standpoint it has really performed well and I have a lot of confidence in the design. The picture below is from a mission we had earlier this month where I was supporting the rescue of an injured climber off of Sloan Peak NE of Seattle. The first three modes also allow you to adjust the brightness of the light for that mode and then toggle back an forth between full brightness and your adjusted lower setting using a feature called "Power Tap" that is located on the left side of the headlamp as you are looking at the headlamp. The Power Tap feature is actually pretty useful as I tend to keep a headlamp at a lower setting when I am just heading down a trail to help conserve battery life and it is handy to be able to just touch the side of the headlamp and have it go back to full brightness to look at something and then quickly toggle back to the lower setting with just another tap. The Power Tap is not a button and works like the screen on your smartphone, so if you are wearing gloves it won't work unless your gloves have a conductive finger tip like the ones designed to be used with your smart phone. 1. A blue light lets you know that you are in lock mode which prevents the headlamp from being turned on when it is stored in your pack. To get into or out of lock mode you hold down the main control button on top of the headlamp until the blue light flashes. 2. The indicator also shows the condition of your batteries when you turn on the main light and either a green, yellow, or red light is displayed. The headlamp is operated through a single button on top of the headlamp which at times can be a little confusing if you hadn't used the headlamp in a while. Here is a little video where I step through the different modes except for the flashing mode I mentioned above. One of the features of the Black Diamond Spot that I'm not all that crazy about is access to the battery compartment for when you need to change the batteries. Access is on the bottom of the headlamp and involves unhooking a snap type of latch which can be a pain if you don't have something to help pry it open. I think this feature has been improved on more recent version of the Spot, but it is the feature that is most lacking in this version of the Spot. 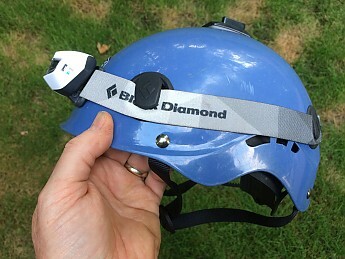 I often use a headlamp on a climbing helmet and the Black Diamond Spot easily installs on the outside hooks of my Black Diamond Half Dome helmet. 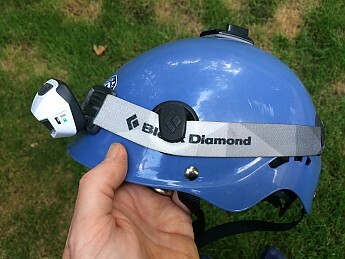 The Black Diamond Spot also has the ability to have the tilt of the headlamp adjusted so you can point it down towards the trail if desired. Here are a couple of shots showing the headlamp installed on my helmet and adjusted in the normal position and titled all the way down as far as it will go. Overall I really like the Black Diamond Spot headlamp and while I may swear a little every time I have to open the latch to change the batteries, the headlamp is very dependable which is the most important thing to me and I wouldn't have any problem recommending this headlamp to someone looking for a good headlamp to carry in their pack. Great review, Mike! Thanks so much for taking the time to share it and pictures and video. I often get annoyed changing headlamp batteries and worry I'm going to break something when they're tough to open, so I understand that issue. Also, thank you for your SAR service! 1) Purchased on sale at REI in 2011. 2) Purchased due to high ratings in a magazine. 3) Only used for camping, backpacking and in the tent, or when answering the call of nature. It is more than adequate for those purposes. 4) I can't speculate on its use for other types of activities. Yes, I would recommend it particularly since the current model has a higher lumen output, although I have not used that version. I am happy with this one. 2 red LEDs for preserving night vision, with Strobe setting. Can turn on Red light without cycling through all settings. CAVEAT: The Spot that I have is the model sold prior to the model currently on the market. The lumen levels for each LED type are lower than the currently selling version, but are more than required. In light of that...pun intended, I am very pleased overall with this headlamp. I backpack and camp with my scout troop, and this product does everything I want with the exception of the output from the Red LED's. I was very disappointed at the low brightness level. I had expected more considering the white LED output is phenomenal. It was not until I used it while camping that I realized the red LED output was far from satisfactory. I have a less expensive but heavier model from EverReady that has red LEDs that far outperform the brightness of the red LED's on the Spot. Beyond that, I could not be more pleased. The distance the high setting illuminates objects is far more than adequate for what I do. However, if I were participating in an activity that consumes distance faster than walking, such as bicycling at night, I would have no qualms about using this headlamp. I have used both NiMH rechargeable and alkaline batteries with no noticeable loss of brightness. But, I would guess that the possibility exists that rechargeable batteries may not produce the brightness of alkalines, and might be the reason that my red LED's are not as bright as I believe they should be. I appreciate the fact the Spot has multiple modes for brightness. Each type of LED has its use. And the lock-out feature is great. I don't have to remember to remove a battery from it to prevent it from accidentally turning on when not needed and running down the batteries. Worked great with brand new batteries, however it would quickly diminish the battery. Carried on my Appalachian Trail thru-hike in 2012. This was a pretty good product, although I had a few problems with it. First off, it drained batteries like nobody’s business. It lasted full-strength for maybe four days, and after that would slowly peter out. I think I replaced them probably every month or two, but that’s because I was stubborn and refused to replace them any sooner. When I did replace them, it was like someone turned on the sun though. I mean…dang. I’ll bet scientists in Japan were scared of an unexpected sun flare or something. And for whatever reason the red light (which me and my friends affectionately nicknamed the “night pee light”), was just not that bright, no matter whether I changed the batteries or not. I don’t know if it was something wrong with just mine, or with the entire model but I do know that when you wake up in the middle of the night, and in the middle of the woods, you’ll probably want a brighter red light so that you don’t pee yourself from getting scared before you’re ready to go. That may or may not have happened to me one night in the Grayson Highlands. Worked fine in the cold and rain, also. The red light is just a nitpicky thing, this really isn’t an item you should worry about too much. Ha! "May or may not have happened.." Brilliant! Great value, extremely bright, and adjustable brightness. Black Diamond claims you can see 80m with this light. I haven't measured but I can attest to being able to see at least 5x the distance compared to my old cheap, no-name headlamp. There are multiple setting for the lights. The close range low power light has a wider beam and allows you to see your immediate surroundings quite well. The full power lamp has a much more focused beam, great for distance. Batteries lasted me for a few overnights. Haven't changed them yet, so they are still going strong. The tap feature is extremely convenient. It allows you to go straight from minimal proximity light to the full power with both lights on with one tap. Accidental taps do happen though, but it is not so common as to negate the usefulness of this feature. The headlamp is waterproof. I have used it in the rain and I dropped it in a pool of water on top of a tarp and it is still good as new. It is great for setting up camp in the dark, reading in the tent, hiking in the dark, almost any nighttime vision needs are suited by this lamp. No need to spend more on a fancier model than this one. Thanks for the review of your Spot, Jonathan! If you have some pictures of your headlamp, those would be helpful to see in your review too. I've owned past models of the Spot—the 130-lumen model (2014-ish) and then the 2016 model—lumens bumped to 200 and waterproofness bumped to IPX8 and have been very satisfied with them. Good all around lamps for a decent price point. This spring during an extended night travel stretch, I couldn't help but notice my buddy's lamp was putting out more light. I asked what he was using. "Black Diamond Spot", well that's odd as that's what I'm using. Unbeknownst to me, BD had came up with yet another improved version with a 50% bump in brightness. I think for most hiking scenarios, 200 lumens is probably sufficient, but you start throwing in some running into the mix, a brighter lamp is advantageous. You can always dial back the brightness if you don't need the full 300 lumens (and increase the burn time as well). Other than the lumen increase, it hasn't changed much. Same weight, same batteries (3 AAA's), good burn times and even the same reasonable price. These are durable lamps that are very weatherproof and pretty lightweight to boot (I almost always use lithiums in mine—lighter, last longer, work better in the cold—albeit expensive). I've used the Spot enough that I can cycle through the modes pretty easily, but it's not overly intuitive—room for improvement here imo. All in all, a good lamp that keeps getting better. Thanks for the review, bigskyrunner. It seems like every year headlamps get brighter and lighter, especially if you just bought an older model! It's hard not to get a tinge of buyer's remorse when a new version comes out right after you buy yours. Fully waterproof protection. It can rain with cats and dogs, not a drop of water will get inside. Reliable and precise. Powerful beam. An interesting feature is the Brightness Memory which allows you to turn the light on and off at a preferred intensity. Lock mode is also extremely helpful. You simply can count on it. Exactly what i need in my long trekking, days and nights. I've been using an old head lamp, different brand, but was never satisfied with it. I have also an ice axe BD (and I just love it!) and decided to replace old gear with BD stuff. Step by step. So I had to buy a headlamp. It was the time to buy a BD. Perfect choice! A one-week trekking trip in West Karpaten (Transylvania, Romania) was relevant for the lamp. Weather is very humid there, it rains a lot. Forested karstic landscapes. Forests, caves, gorges, canyons. Never, not even a drop got inside. Dirt, mud—no problem for the lamp. Hiked also in the nights. Perfect light at around 50-70 m out of the forests and 10-20 m in the forests. The focused light really helped a lot at identifying the tourist marks in the night, even at far distances. I like that it has several settings and modes becaus this way I can have the desired light for different situations and also save batteries' power. And the lock mode is such a great idea! Thank you! I feel it's solid and reliable and gives me the feeling that I really can count on it. I think it's perfect for hiking/trekking, but also for touristic caving. Welcome to Trailspace, Mihai! Thanks for reviewing your Spot. Your Transylvania trip sounds interesting as well. Also, I hope you'll consider reviewing your BD ice axe. Hi Alicia, nice to meet you :) Well, Transylvania itself is very interesting, indeed. Yes, conisdering a review about my BD ice axe, too. Enjoy a shiny day! Bright, small, lightweight, and durable headlamp. I recently purchased this new model of the Black Diamond Spot for a backpacking trip in Europe. I never gave too much thought about headlamps but after having enough of Energizer’s headlamps I decided I did want a reliable (the headband on the Energizer loosens quickly), bright torch I can hike with (without it leaning down while you walk) that will be battery-efficient. This lamp does it ll. I’ve used it for the last two months while hiking in Albania and the GR20, mainly at campsites. Its focused long-distance mode is super bright and illuminates far enough to notice trail marks when you hike at night. Its scattered light mode is exactly what I wanted for campsite. It illuminates a large area with soft unified light, no more getting blinded from close objects. Both modes can be dimmed which really helps to read a book, not to disturb fellow hikers inside a tent, and to conserve on battery life. I used it in light rain and as a lamp for hot steaming shower. It didn’t seem like it bothered it. The strap is very easy to adjust, as well as the unit itself. It stayed in its position while I was walking. It takes about 20 minutes to memorize the different light modes and practice the commands. After you get it it’s very easy to switch modes, dim, or lock. I really liked that it flashes when it gets to the max and min brightness. Red mode can be switched on\off easily. Not as good as the Energizers, but good enough by my standards (and it has more lumens). Too often I switched on the full-power option by accidentally touching the PowerTap when I wanted to adjust the angle of the unit, usually without even noticing it which made the batteries drain faster. I found this option quite un-useful as I never seemed to need a brighter light than the regular modes provided. Thanks for the helpful review of your Spot, Yuvalk. Lasted over five continuous hours outside at -25°F during my most extreme test. Adjustable brightness white light, but doesn't remember the light level when you turn it off. Has red light function too (non-adjustable brightness). Locks for travel so you don't accidentally turn it on. Locks for travel so you don't accidentally turn it on. Battery level indicator on side so you know when to change batteries. Doesn't remember the adjustable light brightness when you turn it off. Red light mode isn't an adjustable brightness. Love this headlamp for night cross-country skiing in Alaska! In a place without light pollution, this light often feels too bright on anything but the lowest setting. Makes me happy because I know I have tons of extra lumen power should I need it. Battery power remains great even on extended cold weather ski journeys (lasted over 5 continuous hours outside at -25°F on my most extreme test. I was even using rechargeable batteries which usually tend to discharge faster [I was using Amazon branded rechargeable AAAs and I do recommend these]). I bought the red version of this light. The strap has stayed really clean even though I've had it for three winters now (granted it doesn't usually touch my skin; I rest the band on my winter hat). Hasn't seemed to have stretched out. First: Doesn't remember the light level you set the headlamp at the last time it was used. There is another, more expensive Black Diamond model which does save the setting. Second: Red light mode isn't an adjustable brightness. I knew both these things when I bought the headlamp but they do still occasionally bother me. Sometimes I wish it were waterproof too, but I also knew this wasn't a feature when I bought it (plus, I never go out in the rain and I have waterproof handheld diving lights if I need waterproofness). This headlamp is much brighter than your average cheap headlamp for only a few bucks more. It's very durable and reliable. Very bright, 90 lumens on its brightest setting. Has a red light feature. Can be locked in the off position. While it's fairly light, it is a bit clunky. 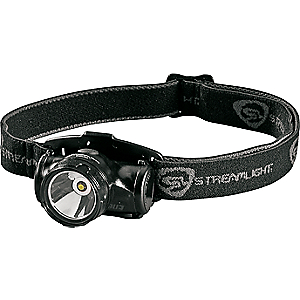 This is a great little little headlamp, at a great little price. I paid $30 (plus tax) for mine brand new. Its brightest setting shines at a nice big 90 lumens. I realize this is probably not bright enough for many of the serious adventure sport enthusiasts out there, but so far I've found it's great for camping, hiking, canoeing, fishing, trail running, adventure racing, and hitching up a trailer in the dark. On the spot light setting it shines bright and far. The manufacturer states that the range is 70 meters. I didn't pace it out and test it at that distance, but I found it shines further than any other headlamp I've owned, and further than any other headlamp my friends had. On the flood setting, it shines less brightly, and provides a much wider field of light. It gave plenty of light for cooking after dark, and was still bright enough that if I wasn't careful, I'd wreck everyones night vision. This headlamp is lightweight. It weighs 90 grams. I know the more expensive lights can be a lot lighter, especially when you locate the battereis on a belt pack, but considering this is a 'cheaper' model, i found it light enough to wear for a long time without it being uncomfortable. It takes 3 AAA batteries. I love when a device uses AAA's, because they are so common, cheap, and light. And also because in a pinch, I could swap batteries between my headlamp, my radio or my GPS. It has a water resistant rating of IP X4. That means it will resist rain and splashes. It would be great if it was waterproof. I haven't dunked it yet, but I've read other reviews where people have stated that they dunked theirs and it survived. It also states in the manufacturers literature that if it gets dunked, you can remove the batteries and leave the battery cover off until it dries, and then it should work again. That's pretty cool to think that if I dunk it, it might not be completely dead (just playing dead). The dimmer works great, so if I'm reading and my wife wants to sleep, I'm not keeping her awake. The red light feature is easy to turn on, and you don't need to turn on the white light first. It can be turned directly to red light, which makes it great for finding something in your pack or tent, and not blinding everyone around you. The switch can also be locked. This prevents it from being accidentally turned on while in your pack and killing your batteries all day long. The headband is very easily adjustable. This lets you go from wearing it over a baseball cap, to on your bare head, to over a toque, and you won't be cursing it and having to take it off 10 times to adjust it too big and small over and over. I have heard that these headlamps are pretty durable. I haven't dropped mine yet, though, so I can't attest to it's durability. It does seem solid though. Another feature it has is a battery power indicator. It tells you if you're batteries are good to go, or getting weak. Basically, I've had a few different headlamps in the $10 - $30 range, and this one beats all the others by a mile. I bought this Titanium- Spot -2011 model headlamp at my local R.E.I., and was fortunate that they held the last one in stock for me to pick up. Apparently this headlamp has a lot of bang for the buck! I would personally say yes this Black Diamond Spot is indeed awesome. I purchased this item for 39.99$ at R.E.I.. I was looking at the store's provided spec sheet on Headlamps, Lanterns, and Flashlights, and this headlamp light was one of the best I believe out of the "High-Output Headlamps", considering my adventuring style. It has a Flood/Spot Bulb Type, 6 modes, Spot, 2 strobe-(2) white-adjustable brightness- & (2) red. The Lumens output is 75 on high & 4 on low(adjustable brightness). The Max beam distance is another major functioning role and it can have a distance of 70 meters, about 229 ft, and reduced to about 6 meters on low, That's far! It takes 3 AAA as its consuming power source, the batteries were included which is nice. The run time is 50 hours on high and 100 on low. The unit weighs 3.1 oz. This headlamp is also pivotable up and down. Overall I am Super Satisfied with my new purchase of this headlamp as I plan to continue to Adventure/Hike/Camp throughout the Southern California mountain areas. This headlamp is not only unique but features many functions that will be able to provide me more than enough functionality to be around camp, my tent, on trail, or even an Emergency situation. Sturdy, bright, and lightweight. Went to the local outfitter back at home last Spring and the fella there talked me into this lamp over a couple others I was considering. And in the end I owe him big thanks. Took this headlamp on my 200 miles of the AT last summer, and several hikes since. Never disappointed me. In fact, the first trip I took it on, I was enjoying a night scope of the conasauga river down in GA, and some how or another it ended up taking a dip in a puddle and smacked a rock...didn't phase it. Also, for what it's worth.. recently was rated 'brightest' by BACKPACKER magazine. One tip- The norm goes with this headlamp as with others... fresh and high quality batteries bring out the best in the product, and it shows. I've taken the Spot on several trips, a humid Perusian cave, a winter camping trip in -30 weather north of Whitehorse Yukon, and I also used it in the mountains of central Madagascar where it rains constantly during monsoon months and I haven't had a single problem. Battery life is great, the brightness speaks for itself and it's light weight is key for my ultralite backpacking trips. The headlamp itself looks good cosmetically and after falling off several ridges and slipping on Yukon ice it's never failed me. Very reasonably priced for what you get out of this headlamp as well. This is the best headlamp that doesn't have a separate battery compartment. It has all the features you'd expect from a headlamp (different intensities and strobe on both settings) The 3 regular LEDs serve the same purpose as every basic led headlamp, but this one really shines with its upper light. It's more than powerful enough to hike in the dark and is all the power I need unless I'm doing something extraordinary (ex: caving, mountain biking at night and some alpinism). I have zero complaints with this lamp. After careful research I purchased two of these headlamps. One each for my wife and I, and we love them. No problems with the lamp staying in its position. It has all the features and benefits found on the Black Diamond Zenix IQ but the Spot weighs half that found on the Zenix and lasts twice as long. Frankly, I don't care where it is made as long as it is quality. This headlamp is quality and does everything I need it to. The price was good for all the things this headlamp can do. I use it all the time and haven’t found anything to complain about. I really like the run time it has. On no moon nights there is nothing lacking, as far as light output or options. The lightweight aspect is nice when you are backpacking. For the price, weight, and light you can't beat it. For the price, weight, and light you can't beat it. Bought it right before a trip and don't have any reason to get another. I was very impressed with this headlamp. It provides both great area lighting as well as a proximety lighting. The three light levels provide enough light for any situation. As opposed to the Petzl Tikka XP, the boost feature is good, but the fact that you have to hold the button down to use this feature discouraged me from buying it. As it states in all the product descriptions that I have read, it sounded like you tap the button and boom, a burst of light, not the case when I handled the product myself. Headlamps are meant to be hands free, that is why I chose the Black Diamond Spot. Did I mention that the Spot is also great for cold weather activities, large button is easy to operate while wearing gloves. Good functional light with some useful extra functionality—strobe light, red light, dimming function. Very useful headlamp. Switching functions is a bit of a hassle while placed on your head, but what do you expect from something so small. Batteries last long enough. Very bright. Amazing features that were beyond what I expected when I took a 10-day loop backpack trip from Tolumne Meadows to Yosemite Valley floor. Other backpackers at High Sierra B.P. camps wanted to try it out. I was so impressed, I got several as gifts. Amazing high beam to allow me to follow trail or get around in camp for setup after dark. The low beam narrowing and dimming when needed to not disturb others. Strap stays put and comfortable adjuster. Light enough without weight and all features at my fingertips. 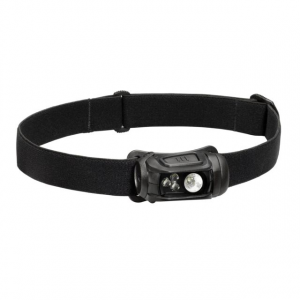 Great headlamp with strong beam, and good battery life. Has battery meter, and and is highly water resistant; it's waterproof unless submerged. Can be locked to prevent it from turning on in a pack. I love this headlamp. It's waterproof, has many features, the best of which is the ability to lock it in the off position. I don't have to turn batteries around to prevent the headlamp from turning on while in my backpack. The battery life is very good; just remember to set it to low whenever possible to increase it. I use the Spot while backpacking. It has very strong high beam. The battery meter is a great feature; green light=good battery life, yellow= batteries getting low, and red= change the batteries. I hike solo a lot, so I carry extra batteries for this, extra batteries for a small Sony Transistor Radio, and 3 LG batteries for my LG G3 (which has a removable battery) in a small waterproof plastic case. I have many headlamps. This is the best I own. To address the con. I wear hat size 7 1/4, and the band is extended to the full amount it can be. Works great for me, but maybe not others. 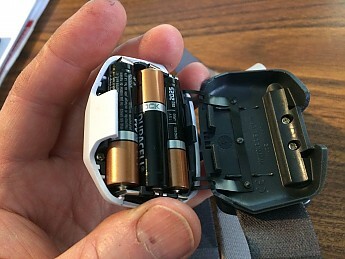 I have used this on 4 overnight trips, plus some day hikes where I end after sunset, and still havent replaced the batteries. And its still more then bright enough, I usually only use it on the lowest setting. Excellent bright light. Easy to use boost function to max light output. Love the light! Super bright with a very easy tap to boost to max output. Have yet to test run times, but so far it's pretty good. My only complaint is the awkward orientation of one of the buckles.The buckle causes the strap to push against the head if tight. Caused an abrasion on my scalp, cleared after loosening the strap. Extremely wide range of brightness settings with the brightest being equivalent to the sun. It would appear that this product has gone through multiple iterations, so I will state up front that I bought mine in January or February 2016 and is the same as that shown on the Black Diamond website in October 2016. I suppose that this would make it a 2016 model. I have used it for one camping trip and often for tasks around the house that require extra light. I have used the light about every two weeks since I bought it. I still need to play with the light controls to figure out how to use the settings other than on/off whenever I need those features because I do not use them often enough to remember them. I have not needed to change the batteries yet, so I cannot evaluate the robustness of battery compartment closure system. The lamp has always been very bright and remains so. Although I could not give an exact distance, the beam easily illuminates clearly to at least 60 feet. The beam width appears to be close to optimal for the tasks that I have needed to work on which include walking and close tasks. The temperatures I have encountered with the headlamp have ranged from the 80s to the low 30s. Light quality did not appear to suffer anywhere in that temperature range. I have not used the headlamp in wet, rainy conditions. I have not dropped the headlamp or exposed it to any other physical abuse. I would like to address some of the negative issues included in other reviews. The hinge mechanism that controls the angle of the light functions without trouble so far. I find the red light option to be adequate at relatively short distances. Thanks for the helpful review of your Spot, shakeNbake. Battery case lock snapped after literally one minute of use. Overall I did not use the lamp in any outside situation, but it seems flimsy and would not survive long. Has many features, but getting to them is not straightforward if you're in a difficult situation with the lamp on a helmet. Then you will have to remember exactly the sequence of getting to the feature you want. First of all, I wanna know how y'all got four AAA batteries in it when only holds three?!?! Primarily, I use this bad chicken for hunting. If need be, cleaning a deer in the field is easy. At its brightest, we have blazed the trail after dark, and I'm leading the pack with this light. Then as my #2 task, Search and Rescue. Keep batteries on hand and this lamp will not let you down. Well priced, easy to operate and dependable. They make two similar lights, the Storm and the Spot. The Storm is 4 batteries, the Spot only 3. Otherwise they look a lot alike. I've moved Adam's review to be under the Spot, until confirmed otherwise. Excellent product. Best in terms of price/performance ratio. Uses three most widely used AAA batteries. These batteries can be found everywhere. But anyway you will not need to carry spare batteries for multi day trips, because consumption is so low that it will last forever. I used it heavily for 4 days, I used almost all modes and intensively used on max setting and battery indicator is still green. 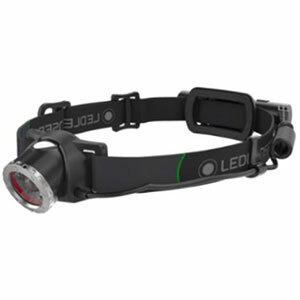 Headlamp has several LEDs so it can be switched between wide and close/ focused and far modes. It has also red "night vision" mode but I didn't use it too much. Flashlight has tons of functions operated by only one button and at the beginning it seems a little bit difficult but soon you will love it. Best is "lock" function which prevents accidental ON when in backpack. It is super lightweight but not completely sure about durability. I have used it several times without problems but I think it needs care cause it seems somewhat fragile. I have already recommended it to my friends and we already acquired several ones. Definitely worth trying! I could have given 4 stars to this product, but last week I was changing my batteries and the plate broke! It seems that where the plate rotates the plastic had started to crack and broke on one side. I tried to change the batteries. 90 lumens of night vision. This 90 lumens of glow is an absolute necessity in any outdoors person's kit. I have two as I ALWAYS carry backup light sources. I've used this deLIGHTful piece of kit for caving, hiking and retreating off countless ice climbs in the dark. It has a red light feature which is awesome for trail finding and NOT blinding my partner. It also has dimmer and flash settings. In my area winter days are short and become very cold at night. I use it almost weekly and this product does not seem inhibited by the cold. I also must mention the battery indicator. BD cleverly incorporated it into the side of the lamp so the user or partner can clearly see the status. I was unsure if I should have bought the 100 lumens product. I now know, for sure, my money was well spent on this one. Great, works and is tough. Great headlamp, very bright with a wide, direct and red mode. A great addition to anyone's pack and a great way to reduce weight. Battery runs down when not used. When I first got it I was very impressed with the amount of light from a small package, however I have since found 2 drawbacks. First, the fixed positions when tilting are not in quite he right places for me — twice as many detents would be perfect. Second, the batteries wear down quite a bit in storage. I got it, put new batteries in and used it briefly, then took it on a trip a few months later and it was not very bright and the battery indicator was red. Light, bright, and adequate headlamp. The only gripe is the method used to cycle through the modes. I am nowhere near an expert on headlamps and I use mine for hiking/camping only (as opposed to climbing, night running, night biking, etc. ), but I will say that this is a decently-powered headlamp and is more than enough for around the campsite. In my opinion, it goes through batteries more than I would like, but that could be due to use, battery type, temperature, and/or my ignorance. My only legit gripe is that cycling through the modes can be annoying (holding the button half-way in took some getting used to). Other than that, not a bad headlamp at all. I gave this a poor review because the new Spot headlamps are nowhere near as good as the old Spots in both construction and optical quality. I have two old BD Spots, one with a worn headband, so I though I'd get a replacement with a promotion coupon. Upon opening the package the first thing I noticed was how much more flimsy the new one was compared to the old — reduced mass in critical areas and paper-thin battery compartment hinges. I probably could have lived with this if the main beam quality wasn't so poor. The entire lens/reflector is a completely different design over the old design and results in a very poor quality beam. This is indicated by the lack of light in the center of the beam, there's actually a dark spot which means the beam is not uniform in light projection. The old Spots had a uniform coherent beam that probably went out to 50-60 meters. You could easily distinguish objects in the wilderness night. The main beam quality in the new ones isn't much better than a $5 incandescent flashlight but I'm sure people will like the low-level peripheral LED function. I also checked out another new Spot in a local store just to make sure I didn't have a defective unit but it exhibited the same poor quality beam. I also checked out the BD Storm which seems to have the same optical design as the old Spot. BD is giving the consumer less and hyping it as an improved design. It's not, it should be a $20 entry level headlamp. If you have or can get an old Spot – hang onto it. 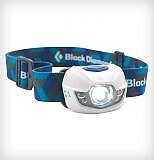 I had previously purchased the Black Diamond's Orbit lantern and was extremely pleased with the quality of BD products. I don't regret my decision - the Spot is a great, light headlamp with lots of goodies (the battery indicator light and lock feature will come in handy). This is a great lamp EXCEPT for one very critical feature. The " tilt" or adjustment that allows you to angle the beam. It is very poorly engineered and comes loose allowing the beam to flop up and down. Very annoying and makes the lamp all but worthless. I plan on taking this back to REI and informing them of this defect. For the price you pay one would expect quality and this lamp is plain cheap and not well built. I would normaly do a long review but this feauture kills the lamp for me. Too many good lamps on the market -- pass on this one and you will be happy you did. My biggest complaint about this product is that the hinge mechanism (which controls angle of lamp) seems like it has loosened up quite a bit. This might contribute to longevity of product. I would not buy this lamp if I had the purchase to make over again. What I liked: It's lightweight -- has three smaller low current LEDs for proximity lighting with three levels of light for both sets of LEDs. Spot is comparably bright to the other headlamps. Princeton TEC EOS is hands down a far better choice. Assembled in the USA at (least they are making an effort), very durable design and even regulated LED that DO NOT flicker! The Petzl Tikka XP is another excellent choice. I really like the diffuser which makes it great for reading or some improved proximity lighting and the instant extra bright boost feature regardless of previous light settings or even being turned off. This is a product that I must sadly give a bad review to. I say sadly, because this is a product that I want to love. Its unique electronics package, which gives you just about every feature imaginable, puts this headlamp head and shoulders above the competition. It is lightweight, has great battery life, and its variable intensity multicolor LEDs work exactly as they should. Unfortunately, the case design is defective. The narrow — WAY TOO THIN — plastic catch, which is supposed to keep the headlamp securely at the desired set angle, is absolutely inadequate. I refer here to a portion of the same piece of plastic that the headband is woven through. Mine lasted about three weeks under moderate use, with no abuse, either intentional or otherwise. After that, it started wobbling up and down as I moved around. Now, the catch makes no contact at all and it is permanently in the down position. I stress, that this is not a case of getting a bad apple. It is definitely a design defect. Therefore, sending it back to Black Diamond for repair is somewhat pointless because the new piece will eventually just break again. The best I can do is permanently superglue it in the up position. Otherwise, it is utterly useless. I use my headlamps at high altitudes, sometimes over 20,000 feet, so I am often in very frigid environments. Freezing cold temperatures make this thin plastic brittle and therefore easily breakable. Therefore, the Spot just isn't appropriate for either high altitude climbing or freezing temperatures. I also have Black Diamond's next model up, which is called Storm. Interestingly, its catch design is not the same, and I believe that it will prove to be far more durable over the long run. Even though it's a little heavier, four batteries instead of three, I recommend buying it instead of the Spot. If Black Diamond redesigns the Spot's case, they will have a five star product. I bought the Black Diamond Spot headlamp some two years ago and have used it frequently ever since. I walk in all weather in all seasons from valleys to mountain tops and as a result I am very demanding of the kit I use. The B.D. Spot is one tough little cookie to crack, over the last couple of years it has been dropped on rocks, kicked (not intentionally mind), bashed against countless branches and had more than a few baths and, surprisingly, it is still intact and has never stopped shining. The batteries seem to go on for ever and even when almost depleted provide enough light to get to ones destination, then some. I find the max setting too bright for most of my exploits and tend to stick to the low or med proximity and only use the max if I am looking for something. The max beam setting gives a usable light for about 30-40m (7-9 car lengths). Min provides a soft light that will not strip you of your much needed night vision but that will allow you to study a map or traverse a difficult patch of terrain. If you come across a cave you wish to venture into and investigate the max setting will serve you well enough. The lamp tilts through about 60 degrees and is still comfortable to wear even at full downward tilt. As a guide to the size of this lamp it will fit neatly into a 6oz cup, strap and all, and at only 85g (INCLUDING batteries) it is feather light. Sadly there are some con's to this great product. There is only one button that does all, on/off and adjusts the brightness. On and off is simple as is swapping between single and proximity lighting, what is not so simple is adjusting the brightness. This is done by gently pushing the button about half way between on/off and released, with bare hands this is easy enough, with winter gloves on it can be infurating as you will inevitabley end up turing it off or missing the requried setting. The second problem is that the settings are cyclical, so you have to go through everyone to get to what you want. This is fine if you are just doing your late night dog walk, but if you just wanted to check the map for a moment with the min setting you can kiss goodbye to your night vision for the next 20 mins or so because you will be dazzled by the other six light intensities. NOTE: I have found that one can avoid the latter annoyance by turning the lamp on in your pocket or covering it up with your hand before you turn it on and then pressing the button 3 times, once for on, once for med and once for min. This is how I get by. I am sorry to drop one star for the sake of a switch because in all other respects this is a surprisingly well built little beauty that I will not be easily parted from.